‘Sayonara’, means goodbye, might be the first word that would come to many of us when we talk about Japanese language. But, if you know more than ‘Sayonara,’ then you may get paid a bit extra than your peers, probability 20 percent of the salary as additional language allowance. Over 5, 000 Japanese companies are operating in India and almost all of them require employees who can converse in Japanese as well as English or any Indian languages, in addition to other technical competencies. For Instance, IBM had given a title for one its job requirements as ‘Need a core Java developer with proficient Japanese.’ It is not only Japanese that would give candidates an extra edge over others; languages like German, Mandarin, Spanish, Italian are also gaining acceptance among Indians professionals, as it will help them to communicate with clients in a personal tone. On the other side, students who are aspiring to get post-secondary education from the US, the UK, Germany, Australia, Canada, France, Japan, and Spain are also looking for an advanced level of understanding of the English language and a basic level of understanding of the countries' native languages. In fact, as part of the selection process for many foreign universities, students must score well in exams like IELTS, TOEFL, GMAT, and GRE. This, in turn, has led them to take up language learning courses. Hence, the sustained growth of student immigration to foreign universities will see many more language learning institutes opening in India. 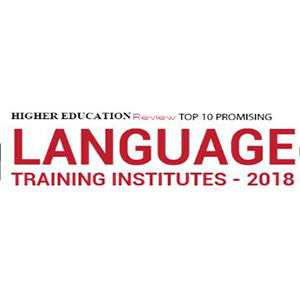 We at Higher Education Review, hence, for those who have pinned studying abroad as a goal in their careers, professionals and hobby learners, have come up with an authentic list of ‘Top 10 Promising Language Training Institutes - 2018. 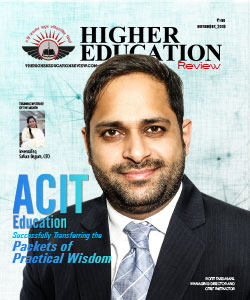 Each organization mentioned in the next few pages has been handpicked after considering the credentials, reputation, and quality of the services they offer. We hope that our efforts will help the parents and students to make accurate decisions about their training partners. Academie De Langues Etrangeres Visakhapatnam, Andhra Pradesh The only institute in India, which is non-European member of European Union Institutions, Academie De Langues Etrangeres aims to address the needs of educational and business communities and promotes the language diversity. Alliance Francaise de Delhi New Delhi, Delhi With a team qualified teachers who specialize in teaching French as a foreign language, Alliance FranÃ§aise de Delhi offers courses that are adapted to teach children as well as adults, professionals, students, housewives and many more. Change Institutes International Bengaluru, Karnataka A training centre par excellence, Change Institutes offers highly focused, well-designed and oriented courses at four levels from fundamentals to soft skills. German Language Centre Patna, Bihar A centre for German language working in coordination with the Goethe-Institute/Max Mueller Bhavan, India, German Language Centre strives to give the best learning environment to the participants through well-equipped Infra Structure. INaWORD Chennai, Tamil Nadu The teaching staffs at INaWORD are combination of native speakers and local talent Â­ all of whom have worked and studied in environments at India or abroad that foster their skills as foreign language trainers. Navis Nihongo Training Center Bengaluru, Karnataka An ISO Certified company, Navis is the only Japanese Language Training Center selected as the sending organization approved by The Government of India & JITCO for the Technical Intern Training Program (TITP) to send a powerhouse of the younger generation from India to Japan and acquire the necessary skills. Pragati The N Power New Delhi, Delhi A leading training provider for Employability Enhancement Program (EEP) and English Language Communication Skills, Pragati The N Power offers basic to advanced level training programs - customized services, high-quality training and competitive pricing. Purohit Academy Mumbai, Maharashtra One of the leading, professional foreign language trainers in Maharashtra, Purohit Academy has trained more than 5,000 students in areas of foreign languages and preparatory courses in GMAT, GRE, TOEFL, SAT, IELTS, TWE, TSE. The Institute of English & Foreign Languages Hyderabad, Telangana The Institute of English & Foreign Languages provides high standards of language teaching at reasonable fees, with students and staff working together to create a friendly and productive atmosphere.